Add more Love to your tradition. 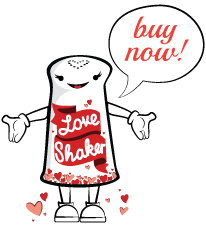 Shake Love into your holiday celebrations. Love is the secret ingredient for christmas cookies tasting magical. Decorate the house inside and out with Love. Trim the Christmas tree with Love. Sing carols with the sleigh bell jingle sound of the Love Shaker accompanying your joy filled music. Add Love to Santa’s treats. Stuff a stocking with Love. Add Love to wrapping presents. Love is the perfect addition to your mistletoe kisses. Pass the shaker around the table and ask each person to share what they gift to and receive from the family. Love really can help everything flow more peacefully during the holidays.